“I’m not scared” is bunny Mithril’s mantra. By repeating the words, they become his truth. From a rocky start, Mithril builds a wonderful life based on courage and faith. 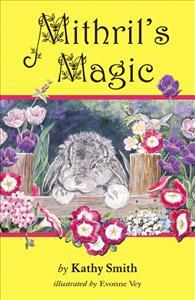 Based on the life of one of the author’s rabbits, Mithril’s Magic weaves details about the joys and challenges of life with companion rabbits into a story of courage, faith, and unconditional love. Mithril’s inspiring spirit and positive outlook on life shine throughout the story, from his farewell to his birth mother through his rescue by a human angel to his journey to his forever home. Evonne Vey’s beautiful illustrations capture the magic of Mithril’s special personality, creating a charming book that parents will enjoy reading to their children and animal lovers can recommend to friends considering a pet rabbit.